Malloy leaves out the fact that his own state has a RFRA. But that law is different from Indiana's in that it provides MORE protection for religious freedom. In Connecticut the person filing the RFRA claim only need show a burden, no matter how slight, on his or her religious freedom. In Indiana, the litigant must show that it is a substantial burden. As any lawyer will tell you, that is an enormous difference. The Connecticut law actually goes beyond even the old Sherbert test that RFRAs are restoring. Of course people have pointed to other differences to insist Indiana's RFRA is stronger than Connecticut's. The problem though is the above difference is prefatory language, a standard that must be met to litigate a claim. It is the critical portion of the statute. And Connecticut's RFRA on that point is much stronger in terms of protecting religious freedom than Indiana's. Unfortunately facts don't seem to matter too much to Governor Malloy. 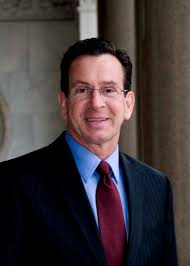 Forgive me if someone else has already pointed out that Connecticut Governor Dan Malloy is a disaster for his State. No one should pay any attention to the presiding officer of a State whose business climate ranks 7th FROM THE BOTTOM. Hoosiers know that the Indiana business climate is reflected in the great increase of jobs in Indiana, the firms that stay here (GE, for instance is threatening to move their business out of Connecticut....). I imagine Mr. Pence has been in contact with GE and don't we have a new GE facility here in Indiana? Of course, Gov Malloy is unhappy but he persists in being an elected fool. No one should credit him with the common sense God gave Geese. His poor record of governance is part of the reason he barely won re-election last year despite CT's overwhelming preference for Democrats. In order to distract CT residents from his poor record he has to resort to name calling and waging a national culture war. But the man is a failure as a Governor and basically operates as a Daily Kos comments section while in office. I'm betting Malloy's comments are in part the DGA signaling that Pence is their number 1 target in 2016. Kind of silly considering there are open races in MO,NH, and VT and McCrory is more unpopular then Pence in a swingier state then IN.